Owner operator with 10 years experience, honest & reliable & reasonable price. 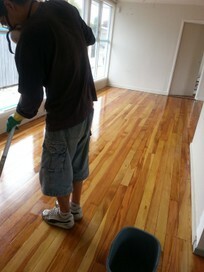 Timber floor sanding & repairs, Supply & installation of timber floor and laminate floor. Specialise in sanding and coating of timber floors, old and new, stain, polyurethane finishes, using either solvent or water base. We provide best possible service, workmanship guaranteed, We also work around your schedule, making the whole process as easy for you as possible. I have been in the building trade for a long time and have used and been around many flooring contractors. These guys have excellent work practice. They turn up when they say they will, have a great attitude, and the job they did was top notch at a very reasonable price. Hassle free experience. I would highly recommended to anyone looking to have their flooring done. excellent communication, fast clean service. highly recommend to all. best price. They have just completed my floors in lounge, hallway and kitchen. I am very happy with their work.